A casebound book, a rack brochure, floor plans, business cards, a marketing folder with newsprint sketch paper stitched in the back, all made in Italy for that exotic feel to promote an upper east side condominium complex. 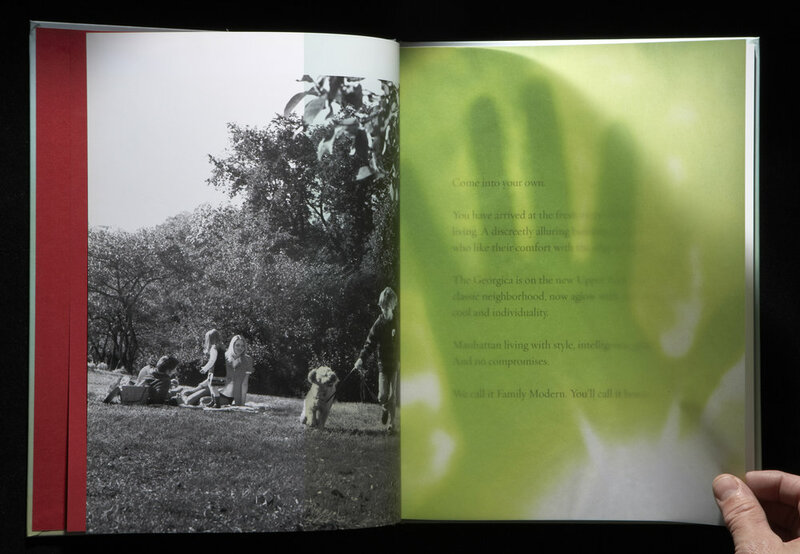 For us, the most interesting element of the project was translucent sheets tipped-in throughout the hardbound book. Jeff Streeper designed each page with images lying on top of images to show light coming through them. We had to impose the book so it was economical to bind-in the translucent sheets between signatures and yet make the story work for Jeff. The other challenge was that each of the other collateral pieces were designed and printed on different substrates and weights. Since they shared many of the same images, they, of course, had to match. Also, Jeff loves textures and reflective inks. Therefore, we used a combination of conventional, UV and metallic inks on uncoated, translucent and coated sheets. All components were produced and managed by the Actualizers, from concept through delivery.